Robyn Rosenfeldt embarks on an odyssey from the middle to the edge, from Alice Springs to Port Fairy, and watches the Australian landscape change with each turn of the wheel. I look around. There’s not a tree in sight. The summer sun is belting down hard on the red earth. From this vantage point I can see no water, no shelter and for that matter no life. And I’m going to spend the next nine days driving through this. What on earth am I thinking? All of this is observed from the comfort of my airline seat as I fly from Melbourne to Alice Springs. In two days’ time I’ll drive out from Alice with three friends, on a journey that will take us clear across the country. South from Australia’s hot, dry centre, along the Old Ghan Railway Heritage Trail, the Oodnadatta Track, through The Northern Flinders Ranges, down into NSW to Lake Mungo National Park, on to Mildura and then across Victoria to our final destination – the sparkling coast at Port Fairy. As we drive south through The Gap, the point at which the Todd River cuts through the MacDonnell Ranges and which marks the outskirts of Alice Springs, we’re all excited to be on the road. 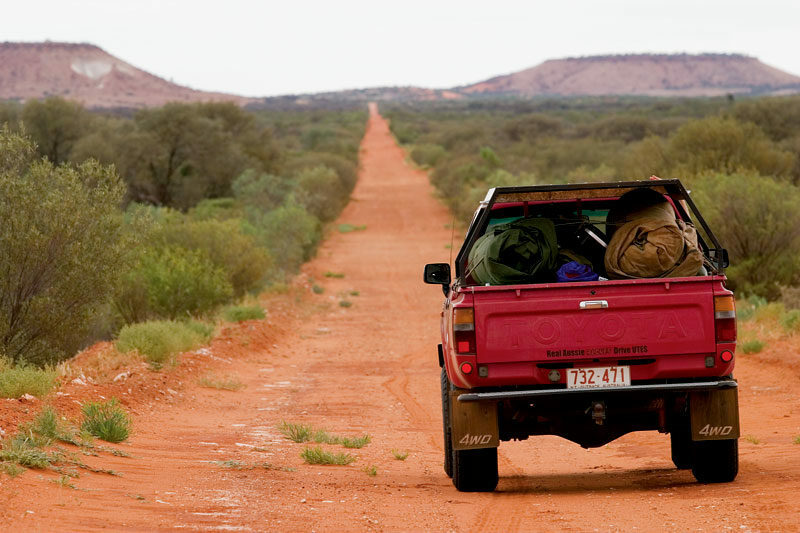 Our big red Toyota is packed with swags, food, guitar, eskies, beer and – most importantly – spare diesel and water. 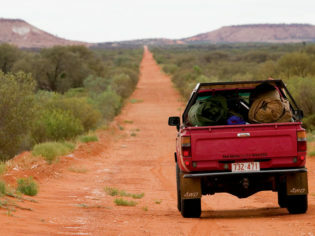 We turn off the Stuart Highway down the Old South Road and, as the wheels spin on the red earth, our adventure begins. The first part of our journey will follow the Old Ghan Railway Line that was abandoned when it was replaced with the current Ghan Line, which runs further west. Named after the afghan traders that rode their camels through these parts, the railway follows the old telegraph line, the construction of which was the impetus for Burke and Wills’ fateful journey.We head south along the dirt red track, past Mt Ooraminna, which we climb before stopping at Bundooma, an old railway siding, for lunch. We’ve barely gone 50km on our journey when we’re almost stopped altogether by swollen rivers crossing the road. Just south of Finke, we come across a creek that has burst its banks and is flowing quickly and deeply across our path. And here I thought this was supposed to be the desert. To be completely safe, we decide to wade through the river before driving, to check the depth and strength of the current. With water thigh high and almost fast enough to knock us over, we’re a little nervous about driving into it. But we realise there’s no going back, so we give it a go; our big red truck forges a path like Moses through the Red Sea. We cross four more swollen creek beds, none quite so deep or fast-flowing, and come out the other end just as the sun is setting, turning the surrounding countryside a fiery radiant red. After stopping to collect firewood and admire the scenery, we find our camp for the night, a glade of red mulga trees by a dry creek bed. Kicking back on our rolled up swags, cool beers in hand, we cook and eat dinner beneath the stars. After a few songs around the campfire we roll out our swags. As I lie watching the stars twinkle through the mulgas, with the breeze blowing across the desert plains, I feel high on life. This is the way to live, out in the elements, in touch with nature. After a quick stop in the morning at the Mt Dare Hotel we drag our swags beneath the shady palms and have lunch, followed by a siesta. Taking our time, we follow the track on to the Oodnadatta through Fogarty’s clay pan, just in time to have a beer at the Oodnadatta pub and find a spot to camp on the clay pans on the outskirts of town. to fill up on fuel and water, we head out to Dalhousie Springs, where water temperatures reach 43 degrees. Just near the springs the old telegraph station buildings stand in varying states of disrepair, beside a mound spring oasis. The salt on the surface of Lake Eyre forms a dry crust, under which lies soft brown sludge. We’re fully aware of this as we drive out on to it, watching the tyres to make sure the earth beneath us is still holding firm. But, like many adventurers, we creep out too far and . . . squelch. We’re stuck. The wheels are spinning and the car’s not moving.Now, just to paint a clear picture of our situation: we haven’t seen another car all day, we have no means of communication and we’re a long way from help. Things are looking dire, so we get the lightest member of our team to jump in the driver’s seat, the boys roll up their sleeves and start pushing, leaving me to do what seems most appropriate in this sort of situation: start taking photos. That is until I’m yelled at. I join in the pushing, eventually the tyres find traction, she rolls on the tracks we came in on and – aaah – sweet, solid ground. That was a little too close. Walking out on to Lake Eyre is like traversing a moonscape. The endless expanse of white stretches out all around you. With an overcast overhead, it’s difficult to see where the sky ends and salt begins. We walk out until all we can see is white in all directions. We’re unsure of where to camp tonight as the surrounding country is vast and vacuous and offers no shelter. Just out of Marree we find a small rise that offers a few ragged saltbushes, so we camp behind them to take shelter form the desert winds. Leaving Marree and “the Ood” (as we now affectionately call her), we head south towards the Northern Flinders Ranges, stopping at the mining community of Leigh Creek to stock up on groceries, diesel, water and (of course) cold beer and ice. Driving into the Gammon Ranges National Park, the mountains rise up around us, erasing the monotony of the vast open plains. Despite our desire to camp rough we head into the Arkaroola Wilderness Sanctuary and Arkaroola itself. After camping wherever we want most nights, we’re a bit perturbed to have to set up in a designated site in Arkaroola, but the pull of their swimming pool and air-conditioned bar wins out. Our night in semi-civilisation is really just preparing us for our gradual immersion back into the populated world. The next morning we leave the ranges behind and head south, our tyres taking their first spin on bitumen as we hit the Barrier Highway on our way to Broken Hill. After crossing the border into NSW at Cockburn, we ponder the origins of such a name, hoping it didn’t involve a nasty incident between a hot billy and an early explorer. We pass through Broken Hill for lunch and take the road southeast to Menindee and the surrounding lakes to a spot called Copi Hollow, where we camp by the shores of the Menindee Lakes. It’s here that Burke and Wills spent their final months before heading off on their ill-fated trip across unknown terrain to the north. From Menindee, we take the road to Pooncarie and turn off to Lake Mungo National Park, home to some of the oldest remnants of human existence. The following morning, after climbing the impressive sand dunes and exploring the old woolshed, we decide we’ve had enough. It’s time to make our way south, into Victoria. Pulling into civilisation – and yes, you can call Mildura that – our rugged attire makes us look like country hillbillies in contrast to the slick, made-up townsfolk. After sipping a very disappointing latte (which I’ve been looking forward to for days) we buy more supplies and find a spot to camp, just east of town on the banks of the mighty Murray. As the golden afternoon sun lights up the huge river red gums lining the bank, we dive deep into the cool, refreshing water. The lush vegetation seems like a green paradise in comparison to where we’ve been. We have a beautiful night feasting on snags and steaks and watching shooting stars pass above the spreading limbs of the red gums overhead. Our final day on the road starts early. Driving south, we skirt the western edge of the Grampians and drive through the reassuring yellow of the Victorian wheat fields, hitting the coast at Port Fairy. As we pull up to the water’s edge, the endless expanse of blue stretches before us, as vast and flat as the deserts we’ve driven through. It’s been an amazing journey. In ten days we’ve crossed our gigantic continent from the red centre to the distant coast – a lot of the time on back roads seemingly to nowhere. But that almost seems the best approach; you experience so much more and the journey is that much more satisfying. We’ve seen the landscape, the colours and the weather change dramatically. And I think a little bit of each of us has changed too.